You might have a stunning looking website, but if the user experience is poor then you end up with an unhappy visitor. And you have a very slim chance of turning an unhappy visitor into an customer or an subscriber. With a professionally developed website costing thousands of dollars some businesses, especially small businesses are choosing to use website builders to build their websites. You get access to professionally designed templates, simple editor to quickly change elements of your site and in most cases hosting as well. If you’re a non techie looking to build a website this will look like a god send. As mentioned above looks are not everything. 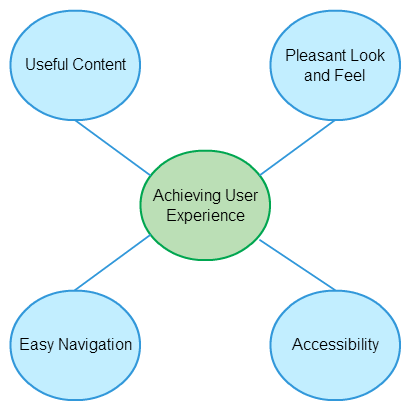 Providing a good user experience is also critical to your success. The exact definition of user experience varies from person to person. Listed below are few common things that can be achieved by almost anyone. This sounds like common sense but you’ll be surprised at the number of website that host useless copied content from all over the web. Whether you hire a professional or build the website by yourself this is something totally under your control. One thing to look for is whether your website builder allows embedding of rich content like videos, slideshows etc which can add value to users. All but the very basic website builders allow this so you shouldn’t have too much to worry about. You might have the best content but if you’re website isn’t appealing to the user then chances are they won’t come back to your website. It is worth noting that people remember how they felt about a website more than what they gained from that website. This is one area where the power of your website builders can have a direct impact. Website building services usually have two approaches to this. One is the structured approach where they provide you with the basic structure of the website and allow you to change the elements of the structure. Website builders like IM Creator takes a different approach by providing you with a drag and drop interface to create a website from scratch. Whatever the approach to immediately start working on the builder is probably not a wise choice. This way you can get distracted by the various features and spend time experimenting with them. A better approach is to create a wire-frame or a mock-up and then build your site according to the mock-up. This way you already know how the website should look like and spend the time actually using the features to your advantage. There are many ways to achieve a pleasant look. A good color combination, quality images that are relevant to your business, good typography and a whole lot more. A good website builder will allow you to easily style different elements by adding colors and shades. Similarly it should support different font types and various font sizes to support your design demands. It should be simple to navigate your site and find the relevant information. There are many things you can do to simplify and improve navigation but here are some basic ones. Needless to say your website builder should support adding menus, adding search boxes etc to implement these features. In a web development making a sits accessible means that even disable persons can access the site and find the relevant information. Make sure the website builder you’re using support accessibility. Most website builders provide you with themes to get started quickly. In some cases although the website builder support accessibility the theme may not support it. So be careful when selecting a theme even if the actual service supports accessibility. Check out this article for more in depth tips to increase accessibility. Listed above are some basic things you can do to achieve a good user experience in website builders. Obviously there are plenty more things you can do to increase the user experience but following the above tips is a good start. Make sure to check out the linked articles to get a more in depth knowledge of how to implement these things. There are various ways that a business – be it big or small – can acquire a dedicated website. You could utilize a free tool from any hosting providers, sign up for a blogging service, or ask a friend who can do it for you. There is a plethora of options in getting your business a website. I really liked this post so i get to know about the value of professionally designed templates rather than regular templates. Great work. Keep it up. The website come with a simple and nice design would be better than the others. Hey Nishadha, I really enjoyed reading your article. I love this post and I really learned a lot from it. Thanks for the inspirations.